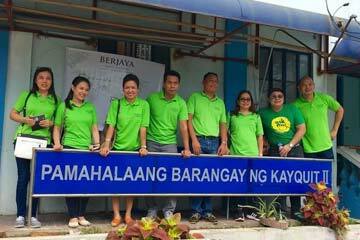 MAKATI, 6 JUNE 2018 – Berjaya Makati Hotel had conducted a Corporate Social Responsibility (CSR) at Indang, Cavite centres to support the livelihood program for the community of Barangay Ng Kayquit. The long-term benefit of this social deed was considered of great significance as it provided the people a way of living instead of the usual activity that would merely last for a brief time. The livelihood project was materialized in partnership with Bureau of Fisheries and Aquatic Resources (BFAR) in order to provide those people who will be granted by this program with proper knowledge in raising such kind and how to sustain them. 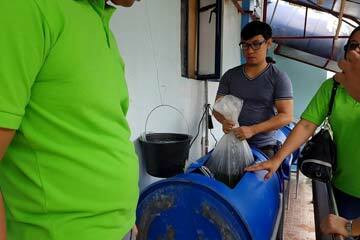 Moreover, Cavite State University was also part of the team since they initiated to conduct prudent study beforehand. Berjaya Makati Hotel, on the other hand was involved in financial assistance with regards to acquisition of tilapia fingerlings and other necessities for the setup. Lastly, Barangay Ng Kayquit will eventually be assisting in terms of promoting the project in due time when families are well versed with the new livelihood program. With a collective effort, they worked for the actual setup to be distributed among the certain number of families and part of the plan is monitoring and to act on relative matters accordingly. This social drive that was carried out by Berjaya Makati Hotel and was participated by associates and managers of different divisions of the hotel such as Front Office, Housekeeping, Kitchen, F&B, Security Human Resources, Finance and Executive Office which was spearheaded by our Resident Manager, Gladiolyn Biala.